Well, finally the new business cards are printed. It has taken many months to finalize the design (thanks to help from the team at Creative Engine), and I’ve been dreaming of a card like this for much longer. You know the old story about a cobbler and his shoes? The cobbler is so busy, he never has time to fix his own shoes. Same goes for printers I guess. Old School; I used letterpress printing for the front, or name side. The machine that printed these was manufactured in the 1930’s. We used modern fonts and etched the type dies in magnesium mounted to a wood backing. 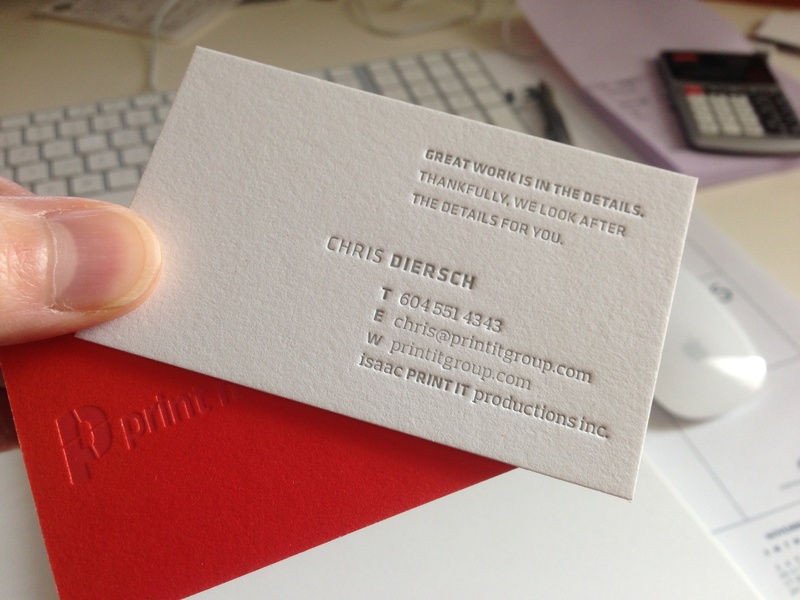 The light grey ink we used was carefully chosen as to display the shadow feature of the deep deboss from the impression. If the ink were too dark, it would lessen some of the effect. New School; The colour side, or back is printed on a new HP Indigo digital press in 4 colour process. We made a tangerine/red gradated and a blue gradated version. Both colour versions have our new logo stamped with a deboss impression and a clear thermal transfer foil stamp to give it some shine to contrast the toothy 100% cotton paper. One of the challenges was that the HP Indigo digital press can only handle a maximum of 16pt cover stock. So for that side we used a 92lb cover stock (16pt) and then laminated it to the letterpress printed side which was printed on 184lb cover stock (30pt). For a somewhat insane 46pt thick card. The most fun is watching a prospect receive the new card. Everyone is amazed. The first word they say is; “Thick!”. I wanted a card that showed true craftsmanship – something that I take seriously everyday.